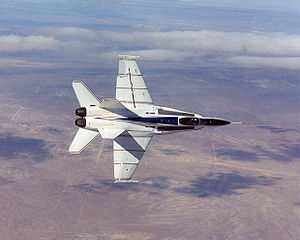 The X-53 Active Aeroelastic Wing (AAW) development program is a completed research project that was undertaken jointly by the Air Force Research Laboratory (AFRL), Boeing Phantom Works and NASA's Dryden Flight Research Center, where the technology was flight tested on a modified F/A-18 Hornet. The program was led by a cadre of people from these organizations, including Edmund W. Pendleton and Dr. Ken Griffin from the Air Force. Denis Bessette and Dave Voracek from NASA Dryden. Pete Field, Dr. Jim Guffey, and Eric Reichenbach from Boeing St Louis. Gerry Miller of North American Aviation (later part of Boeing). Jan Tulinius led the development of the initial concept during wind tunnel testing in the mid 1980s under Air Force contract. The designation "X-52" was skipped in sequence to avoid confusion with the B-52 bomber. AAW Technology employs wing aeroelastic flexibility for a net benefit through use of multiple leading and trailing edge control surfaces activated by a digital flight control system. At higher dynamic pressures, AAW control surfaces are used as "tabs" which are deflected into the air stream in a manner that produces favorable wing twist instead of the reduced control generally associated with “aileron reversal” caused by trailing edge surfaces. The energy of the air stream is employed to twist the wing with very little control surface motion. The wing itself creates the control forces. An aircraft maneuvers by deploying flight control surfaces into the airflow, which modify the lift of the surface they are attached to. For instance, the ailerons on the wings used to roll an aircraft work by increasing or decreasing the lift of the outer portion of one wing, while doing the opposite on the other wing. This imbalance in lift forces causes the aircraft to rotate around its length axis. The effects of ailerons on lift are complex; some of their effect can be attributed to the change in overall curvature of the wing as a result of their movement, while some of it is due to Newtonian deflection of the airflow. The same problems affect modern aircraft as well, but are engineered to be less noticeable. To start with, improvements in materials and design has greatly improved the stiffness of the wing, reducing the magnitude of the problem. Once the plane is built and flown, the flight control software is then adjusted to correct for the loss of control due to aeroelasticity. However, this simply hides the problem; the aeroelasticity still exists and is affecting the overall control authority. To correct this the flight controller uses more control input to offset any loss of effectiveness, which increases the torque loads on the aircraft. But if one can use the controls to eliminate the twisting and its negative effects on control input, the next step is to deliberately introduce a twisting component to improve the control authority. When applied correctly, the wing will twist less and in an opposite direction to a conventional wing during maneuvering. So this change, which can be accomplished in software, has numerous benefits to overall performance. To test the AAW theory, NASA and the USAF agreed to fund development of a single demonstrator, based on the F/A-18. 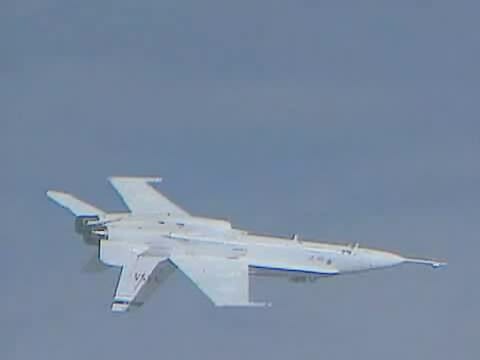 Work started by taking an existing F/A-18 airframe modified with a preproduction pre roll mod wing, and added an outboard leading edge flap drive system and an updated flight control computer. Active aeroelastic wing control laws were developed to flex the wing and flight instrumentation was used to accurately measure the aeroelastic performance of the wing planform. 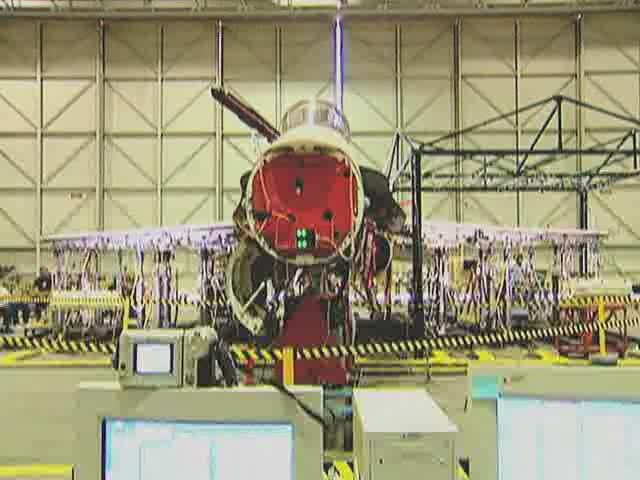 Flight software was then modified for flight testing, and the aircraft first flew in modified form in November 2002. The aircraft successfully proved the viability of the concept in full scale during roll maneuver testing in 2004-2005. The test aircraft was re-designated X-53 on August 16, 2006, per memo by USAF Deputy Chief of Staff, Strategic Plans and Programs.